Call bridge is a game of tricks, trumps and bidding which ispopular in Bangladesh. It seems to be related to the North Americangame Spades. The rules vary from place to place, and several ofthese alternatives are described in the variations section.Playersand CardsThis game is normally played by 4 people using a standardinternational 52-card pack.The cards of each suit rank from high tolow A-K-Q-J-10-9-8-7-6-5-4-3-2. Spades are permanent trumps: anycard of the Spade suit beats any card of any other suit.Deal andplay are counter-clockwise.Any player may deal first: subsequentlythe turn to deal passes to the right.The dealer deals out all thecards, one at a time, face down, so that each player has 13 cards.The players pick up their cards and look at them.BiddingStartingwith the player to dealer's right, and continuing counter-clockwiseround the table, ending with the dealer, each player calls anumber, which must be at least 2. (The maximum sensible call is12.) This call represents the number of tricks which the playerundertakes to win. In this game the tricks bid are known as"calls".The player to dealer's right leads to the first trick, andsubsequently the winner of each trick leads to the next.Any cardmay be led, and the other three players must follow suit if theycan. A player who cannot follow suit must trump with a spade,provided that this spade is high enough to beat any spades alreadyin the trick. A player who has no cards of the suit led and nospades high enough to head the trick may play any card.The trick iswon by the player of the highest spade in it, or if it contains nospade, by the player of the highest card of the suit that was led.A player who is able to play a card of the suit that was led is notobliged to head the trick. This also applies when spades are led:players may play higher or lower spades as they wish. A player whohas no cards of a suit is said to be "off" that suit. If is off thesuit that was led, and there are no spades in the trick yet, theplayer must play a spade if possible. If there is already a spadein the trick, the player who is "off" the led suit must play ahigher spade if possible. If the player only has lower spades, heor she can "waste" one of these spades to avoid taking an unwantedtrick later, or can throw a card of another suit.To succeed, aplayer must win the number of tricks called, or one more trick thanthe call. If a player succeeds, the number called is added to hisor her cumulative score. Otherwise the number called issubtracted.For example, a player who calls 4 must win 4 or 5 tricksto succeed, and in this case gains 4 points. Winning 3 or fewertricks or 6 or more tricks counts as a loss, and the player loses 4points.Calls of 8 tricks or more are bonus calls. 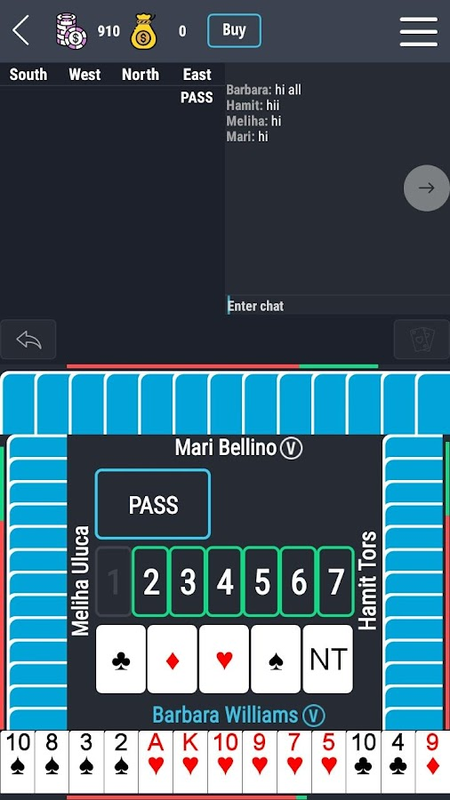 A player whocalls 8 or more scores 13 points (instead of the amount of thecall) if successful. If unsuccessful, the amount of the call issubtracted as usual. So for example a player who calls 9 scores +13for 9 or 10 tricks, but -9 for 11 or more tricks or 8 orfewer.There is no fixed end to the game. Players continue for aslong as they wish, and when the game ends the player with thehighest score is the winner.